In words and music, songs and photographs, this captivating songbook tells the story of a mostly unknown homemade singer-songwriter. A lawyer by day and night, and a songwriter in between, Doc Schneider has written more than 100 songs over the last four decades and released three albums--Choices & Chances, Second Chances, and Songs & Stories Live--all available through iTunes, CD Baby, YouTube, Spotify, and Pandora. His songs have found a few dedicated listeners across the United States and in tiny pockets around the world in Bruges, Paris, Malta, and elsewhere. This songbook offers sheet music and lead sheets to accompany the released albums should anyone out there want to play a song or two. But this is more than a songbook. It is the story of a love affair with music. Tracing his path from the trailblazing singer-songwriters of the early 1970’s (These Were My Friends) to his own efforts over the ensuing years (Homemade Song), this book puts the songwriter’s art form on display and reveals the family that carries him on his way. 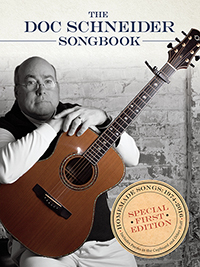 For readers with or without guitars, this unique collection offers a joyous adventure through the process of creating songs, with some poems and stories along the way in this special First Edition.